Hooded All-Season Child's Crochet Cardigan - Sizes Newborn - 14. 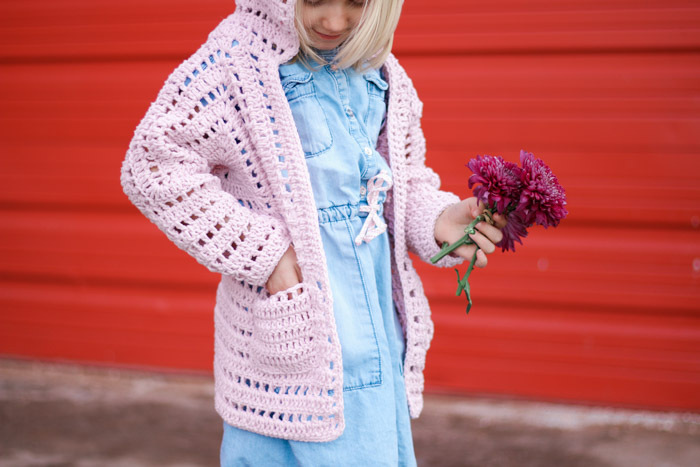 This free child’s crochet cardigan pattern is part of a collaboration with my friends at Lion Brand Yarn. This post contains affiliate links. But she’s inquired so many times lately that I finally asked her if was really hoping she’d be the recipient of a project soon. The thing I love most about this yarn though is that the color palette has a really nice range of “baby” colors and more sophisticated adult shades. See all the delicious colors here! I chose this particular color, which is aptly called “Pink” in celebration of Lion Brand’s color of the month for February. 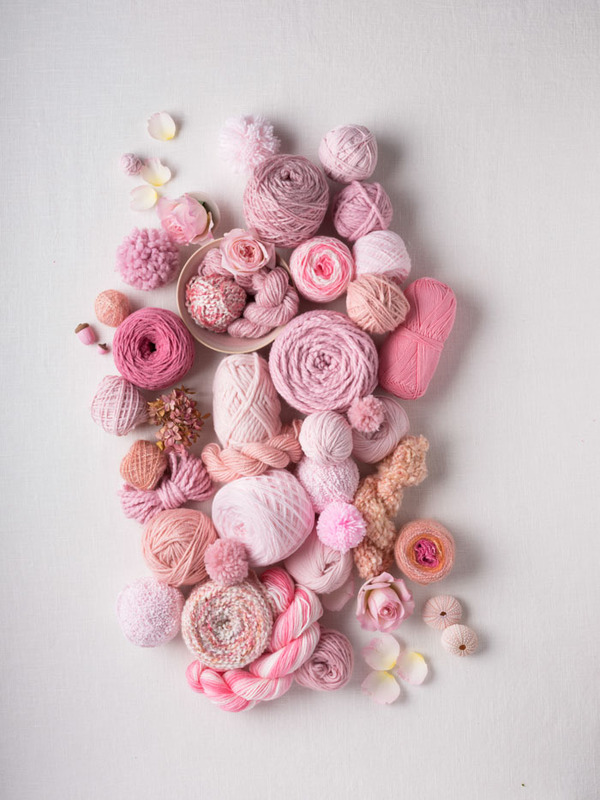 I could gaze at this collection of “Antique” (pink) yarns all day! 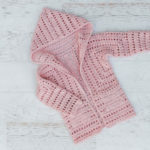 Plus, all pink yarns are on sale right now at LionBrand.com, making this the perfect time to whip up this child’s crochet cardigan. 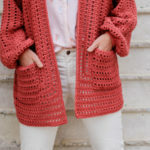 The chain spaces in this girl’s sweater make it the perfect weight to wear pretty much year round, but wouldn’t it be especially cute for Valentine’s Day or Easter? I love the idea of making one for each of the girls in a family in a different color. 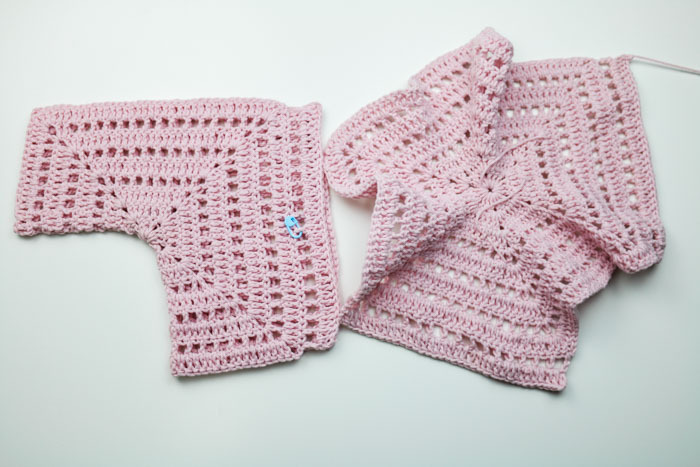 You’ll see that the pattern to modify for newborns, toddlers, preschoolers and older girls–everyone can have one! 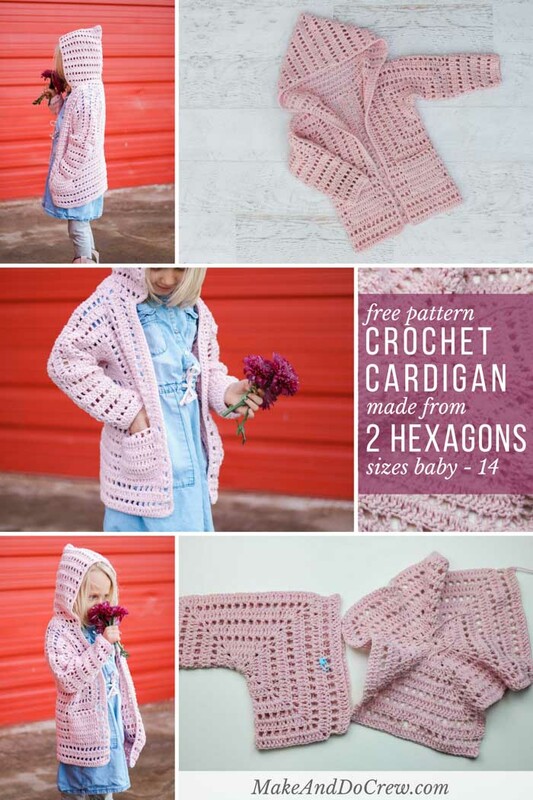 The construction of this pattern is really quite simple because it’s based on two hexagons that are folded and seamed to form the front, back and shoulders of this child’s crochet cardigan. 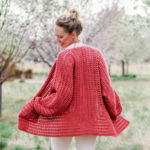 The pattern looks a bit lengthy, but please trust me that once you get the hang of the two types of rows used in this sweater, it’s really much simpler than it appears in writing. 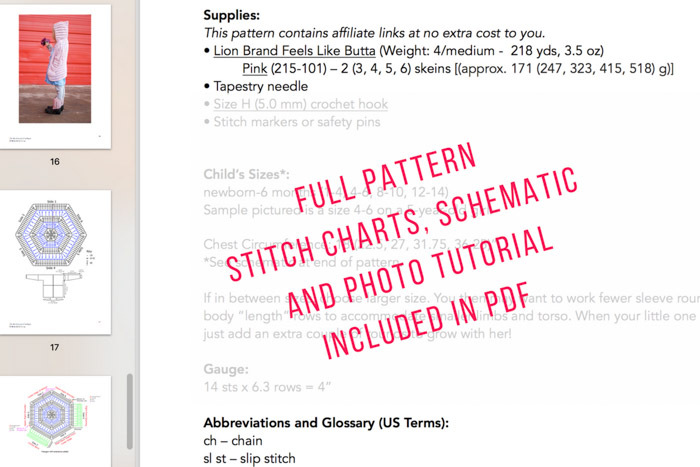 You can pick up the ad-free, printable PDF with both stitch charts and a sweater schematic for $3.00 here. Find Part 2 of the free pattern here. Don’t let the pattern length intimidate you. 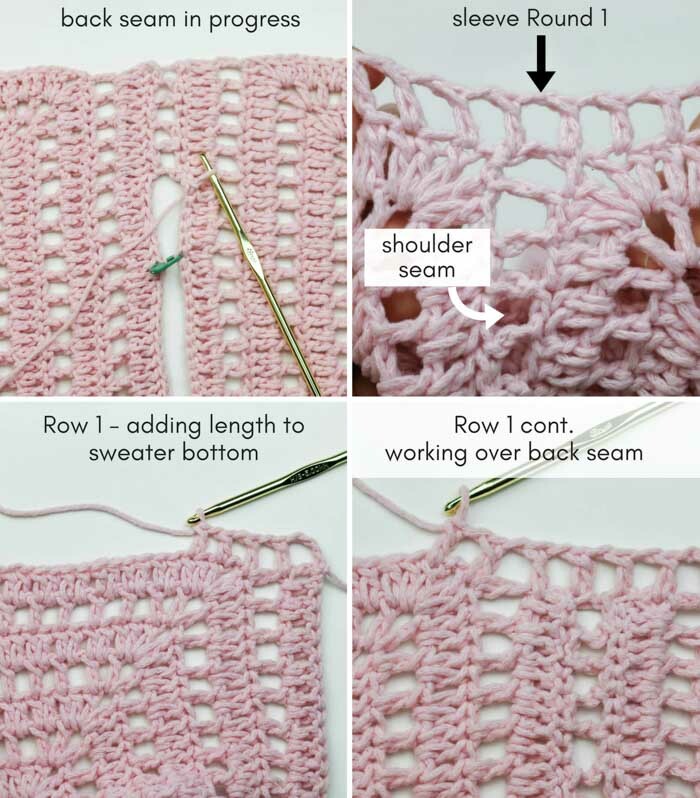 Once you understand the basic idea of how the rows and rounds are worked, you’ll be off to the races with this simple sweater! Skills necessary include double crochet and crocheting in the round. • See photo above (or chart in pattern PDF) for visual instruction. Foundation: Ch 4, sl st to first ch to join. 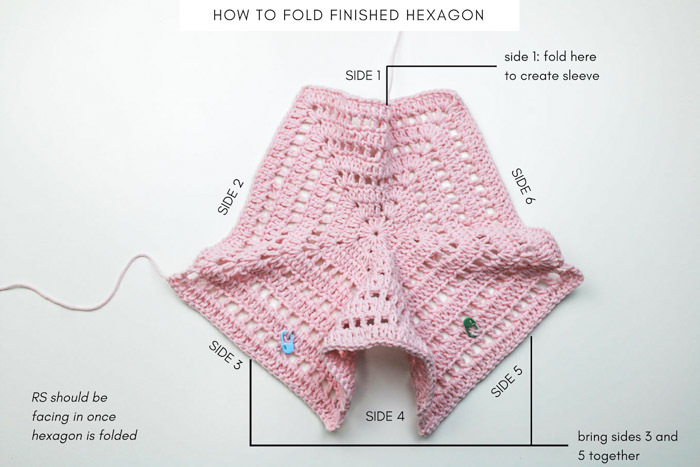 • See photo below or stitch chart in printable, ad-free PDF for hexagon with completed extensions. 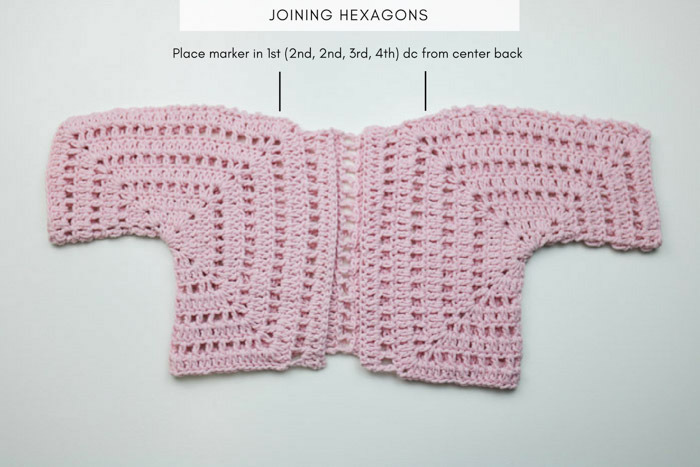 • Rows 1 and 2 extend two sides of hexagon to create front edge and center back of sweater. When working Row 1, check to make sure ch-1 sps line up with ch-1 spaces from last ch-1 sp row of hexagon. With RS of hexagon facing, attach yarn in first dc of side 3. With RS of hexagon facing, attach yarn in first dc of side 5. Rep Rows 1 and 2. Fasten off. Repeat entire sequence on second hexagon. 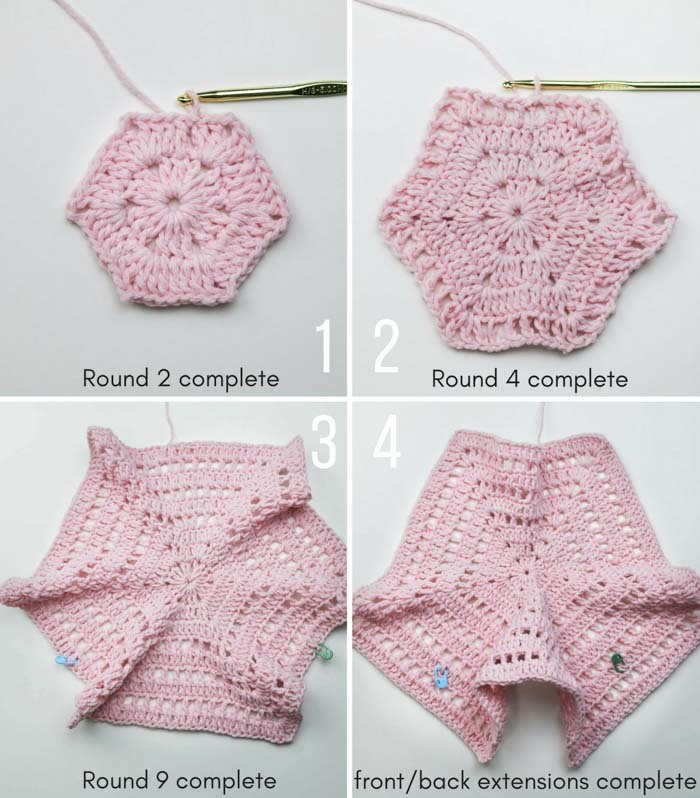 • Hexagons are joined using a series of chs to mimic the look of Round 4 of hexagon. • See photos below for visual explanation. With RS facing in, fold first hexagon so that side 3 and side 5 are aligned. PM in 1st (2nd, 2nd, 3rd, 4th) dc from center back along upper shoulder side of hexagon. Rep with second hexagon. Attach yarn in one corner sp at end of sleeve. Ch 2, sl st to join in opposite corner sp, sl st 2 into first dc on same side; * ch 2, sl st to join on opposite side, sl st 2 on same side; ch 2, sk 2 dc on opposite side; rep from * to marked sts. Fasten off. Attach yarn in one corner sp at top of neck. Ch 2, sl st to join in opposite corner sp, sl st 2 into first dc on same side; * ch 2, sl st to join on opposite side, sl st 2 on same side; ch 2, sk 2 dc on opposite side; rep from * corner sps at bottom of sweater. Fasten off. • In order to evenly place ch-1 sps around Round 1, treat ch-2 sp at each hexagon corner as a dc to skip. Similarly, horizontal dc of shoulder seam counts as 1 dc to skip. See photo grid above. 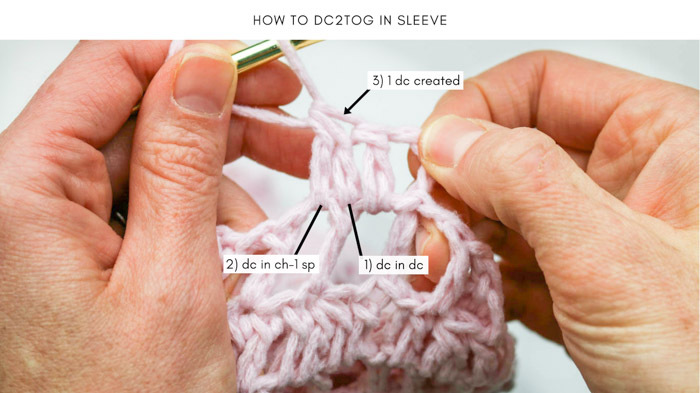 • See photo above for visual explanation of dc2tog. Rounds 6 & 7: Rep Rounds 2 & 3. Rounds 7-9: Rep Rounds 3-5. Round 7 (dec): Ch 4, skip next dc, dc2tog, ch 1, skip next dc, [dc in next dc, ch 1, skip next dc] to last 3 dc, dc2tog, ch 1, sl st to 3rd ch from beginning of round to join. (20 ch-1 sps & dc). Round 3 (dec): Ch 4, skip next dc, dc2tog, ch 1, skip next dc, [dc in next dc, ch 1, skip next dc] to last 3 dc, dc2tog, ch 1, sl st to 3rd ch from beginning of round to join. (26 ch-1 sps & dc). 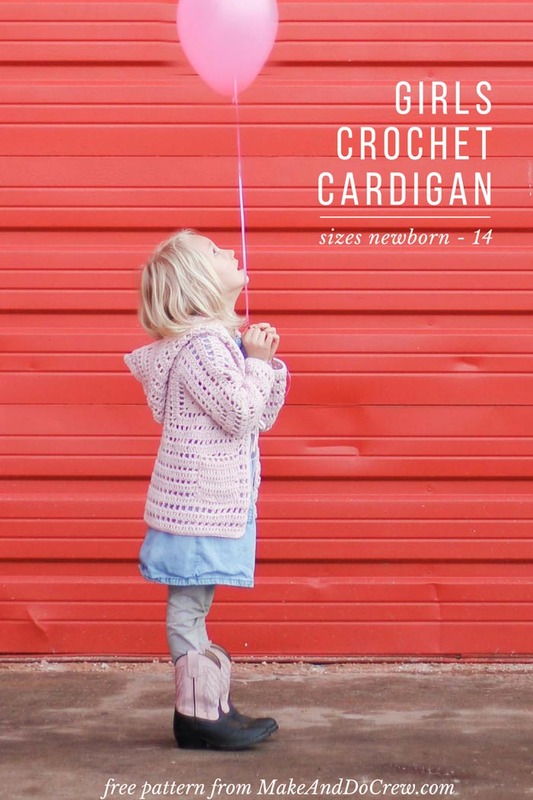 Now you’re ready for Part 2 of this child’s crochet cardigan pattern where we’ll add length to the sweater, and create a hood and pockets. Head to Part 2 here! Can’t wait to make this for my girls, I made the Campfire cardigan in a childsize, I assume it’s a similar concept! Thank you, Sarah! What a lucky granddaughter! As usual you come up with the niftiest items and your instructions are clear and easy to follow. 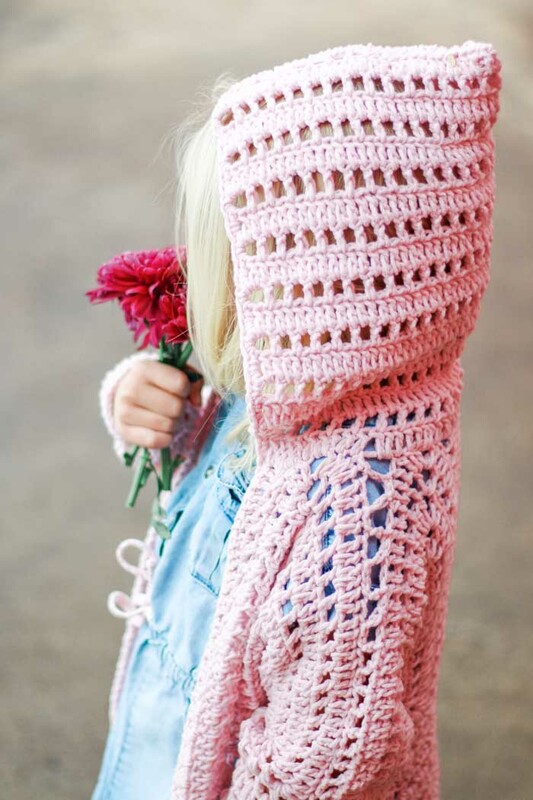 I want to make this for my grand-daughter, but not in pink. She likes purple! Unfortunately I will have to wait until my shoulder heals and then I will be able to wield my trusty crochet hook again. My fingers just itched for yarn when I saw this pattern!! Can’t wait to get started on it. Thanks for all your creative ideas, and thanks for sharing them with us. Great sweater. I love seeing yarn I can find. I agree! I really try to use yarn that’s accessible to as many people as possible. 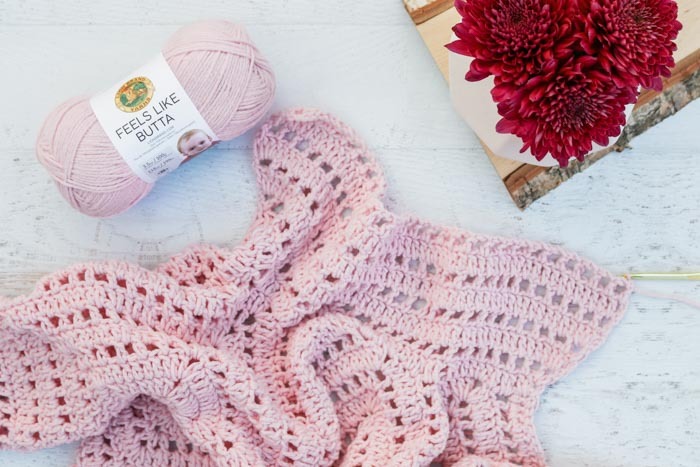 I really, really enjoyed using this new yarn and I hope you do too! Jess, this is my first attempt at crocheting a cardigan. I have the two hexagons made, but now I am at a total loss trying to follow the instructions. I am making it a size 12-14. Is there a tutorial of something similar that might help me? I e to have gotten this far and have to give up on it. I am disabled and have just started crocheting again and it has been quite helpful and enjoyable.